There is a new "Y" PEZ. Word is that it is available at the BYU Bookstore. This is the old, original BYU PEZ. At your neighborhood Chuck E. Cheese there is available the new CHUCK E. CHEESE PEZ. 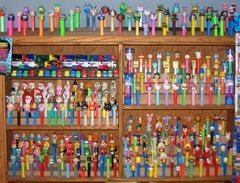 OF course, in honor of our own Jessie - the Toy Story character PEZ is donated to the museum on Katie's birthday. This completes the TOY STORY series as issued to date. In honor of three Cornwall grandsons - Bennett's Birthday, Jarom's one-year old birthday and Daniel -boy (making a fun 3-some of Cornwall cousins) the THOMAS the TRAIN & FRIENDS new PEZ series becomes part of the collection. Trains: what every little boy evo' wanted. In honor of the birthday of Jeffrey (the biggest ham in the family) HAMM in the BEST OF PIXAR series joins the collection. In honor of Stefanie's birthday the cute little SLINKY DOG is added.